Sometimes reader friends will mention that a certain outfit I wear/post doesn't look like my "normal" style. I, by no means, take this in a negative way because I know it is not meant in that manner. It does however make me scratch my head and ask myself, "What category do people put my style in?" I come here on a daily/weekly basis and show you me. If we were to ever meet on the street you would see me as you do on my blog...when I don't have a big zit and have my make-up on. I don't fit a certain mold. I don't have a certain style, per se...I never have. I really do like most everything that relates to fashion, trends and genres. What I put on when I wake up depends on a handful of things; my mood, plans, weather or if I just bought something new that I am dying to wear. At the end of it all, I guess my style would be eclectic...a mix of this and that, but all things 100% me and my personality. Sometimes I feel feisty, edgy, girly, bohemian, country, professional, whimsical or a little bit of everything all rolled into one. This past weekend when I wore this look, I felt a little "cowgirlish" being at the Ft. Worth Stockyards, Wednesday I was channeling a boho vibe, Monday I shared some leather love and last week was a whole other mix of adjectives. If you think about it, personal style is exactly like wanting a greasy burger one day and a steaming plate of enchiladas the next, jamming out to an old school rap song one minute then belting out your favorite love song ballad, flipping back and forth between Friends re-runs and the NBA playoffs, burning a peppermint scented candle in the winter and citrus fruit in the summer, having one friend you can tell your deepest, darkest secrets to and one that you always want to vacation with...you get my point? The beauty of getting ourselves "dressed" every day is that we can visually express our emotions, attitudes, personalities or whatever we are feeling at the moment. It's almost like a time capsule we get to dig from the ground one day to look back on and see where we were at during certain moments in our lives. It's a true reflection of us...just like food, music, entertainment and friendships...it's all an art. I truly believe we are all living, breathing, walking pieces of pure craftsmanship...not just in what we wear, but the people we are underneath the clothes, shoes, make-up and jewelry. On that note, I hope you guys have a fabulous weekend. As we speak, I am on a Girl Scout Sea World adventure with too many nine-year-olds to count. Pray for me. lovely look! have a great weekend! 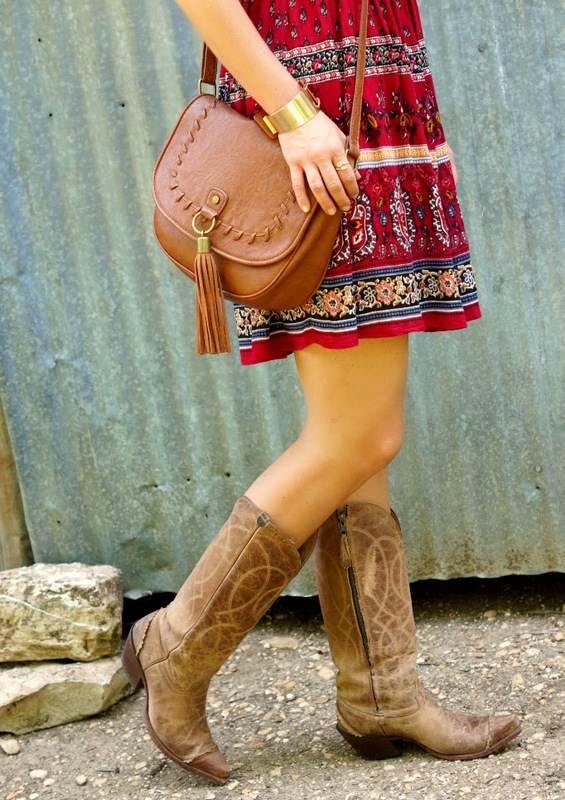 I love the fringe on the bag and the boots! It really is the perfect touch for summer! Have a great weekend and good luck with all the 9 yo. Love that dress. Cute dress, I love the pattern. I also dont really have a personal style, still discovering myself but at the moment I just wear what I feel like wearing on each given day. Great use of the food as a metaphor to compare. I don't think I really have a specific style either...maybe colorful? 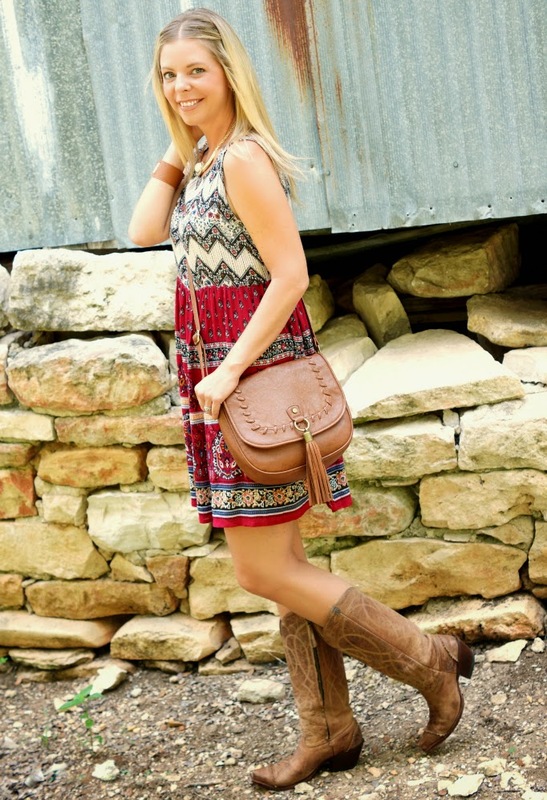 If I like something, I will wear it :) This dress looks amazing on you, love it with the boots! Loving the boots! You look so comfortable in this! In love with this outfit! So cute! This outfit is adorable. LOVE IT. And I totally agree when it comes to style. For the most part I'd say I'm pretty classic and feminine, but there are times when I want to look more bohemian or edgy! I totally agree! I am all over the place when it comes to fashion. Love those boots! Well said girl!! It's hard to have just ONE style especially when you're in the fashion world! I'm constantly being inspired by bloggers and wanting to try something new... that's the point right?! You always look great! Fashion would be boring if we all wore the same exact thing each day! It is fun to dress for the mood we are in and where we are going : ). Good luck this weekend!! Such a gorgeous dress girl! I don't think you have a category since you're so versatile! I love that about you. You're versatile but attainable! Seriously LOVE your fashion analogies and never thought about it like that, but how true that is!!! You are always so cute! 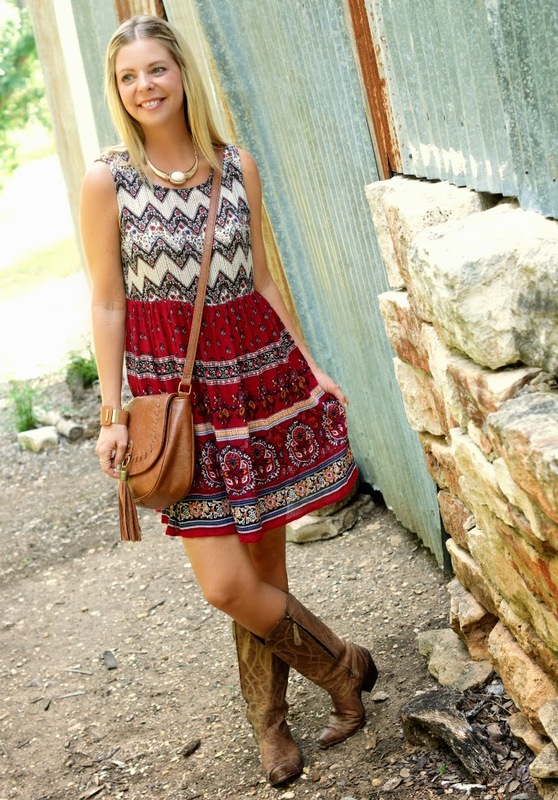 This dress is so cute styled with the cowboy boots! What makes fashion fun is that we don't have to wear the same style every day...it's nice to change it up! Super cute, Shanna! And it's so true what you said about musical, food, or TV show tastes being like style. We don't have to be locked into particular categories, but get to express ourselves as unique and diverse beings. But one thing that's true about everything you wear, no matter what, is that there's always something about your outfit that's FUN! 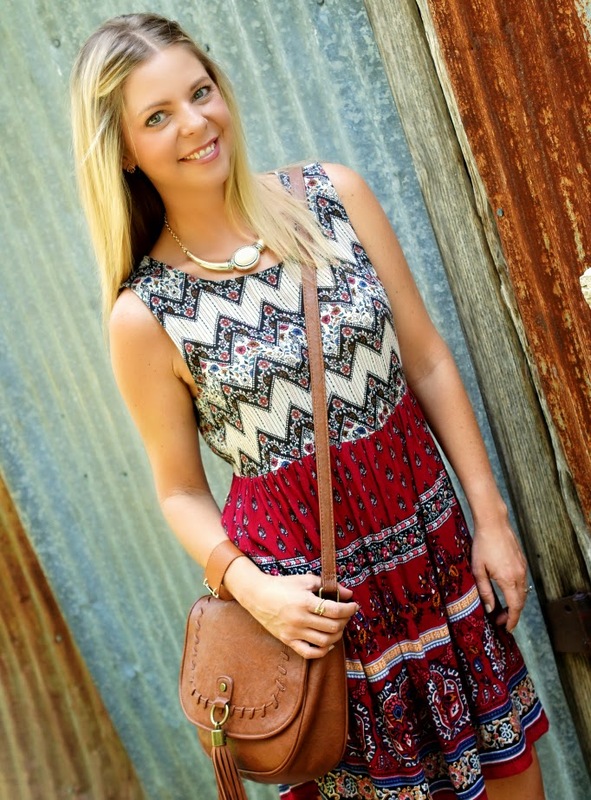 Whether it's a patterned clutch, a loud necklace, the dress you're wearing, or an all around colorful outfit. Oh, and of course the other thing that's always true about your outfits is that you look super cute and stylish! Um first, I love your boots. Second, I think it's interesting that people have said that certain outfits don't seem to fit your style. Because even though your style is eclectic, I still think everything you wear is so YOU. I agree - I think I've always associated your style as dependent on the day and situation. You're all over the place, in a good way! I'm the same way, and I find myself thinking I know what my personal style is... but then finding something completely out of that zone and loving it too! Definitely agree about your "style". I think mine is the same - a mix of everything. It gets boring to wear the same type of outfit all the time, right? As I wrote in my latest post....blogging is great because it makes us get out of our comfort zones or make us think outside the box! And you do it so well Shanna...more power to your girl scout chores! That dress looks super cute on you! It's fun to step out of one's fashion comfort zone once in a while. Have fun at Sea World! Love this post and it's so true; I don't have a style at all and I wouldn't have it any other way.. 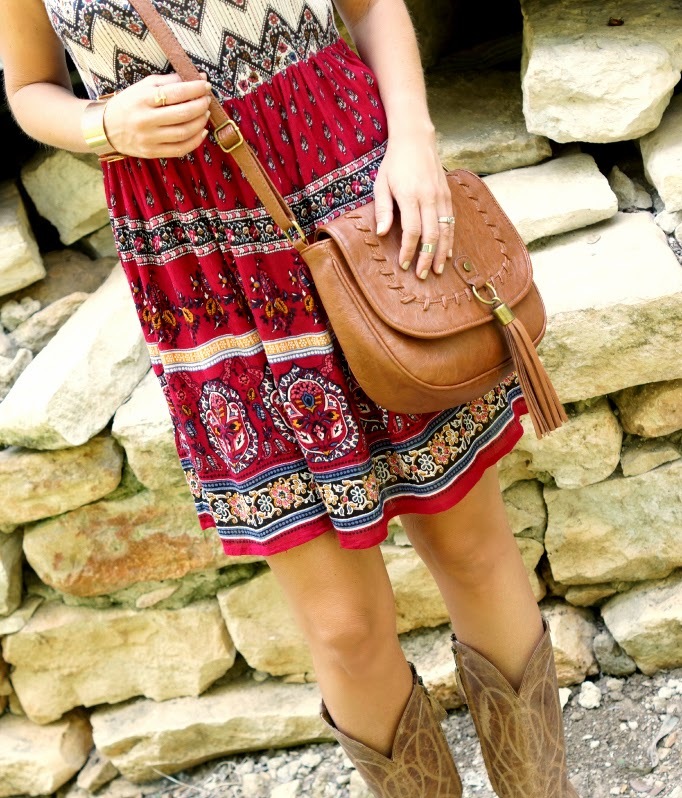 Being an Okie girl I always love a Western look :) Dressing is a great way to express yourself and I completely agree! cute dress! loving your look! This is so interesting, because now that I think of it I've never seen you in anything I thought wasn't you, yet you always have something different on! You are eclectic, and I love that. I agree that getting dressed should be fun and express who we are on any given day, and we should dress for that. Also, Sea World with 9 year olds, YIKES! I love this dress, so pretty! You always look amazing Shanna! Fashion to me is all about having fun and expressing yourself. I enjoy seeing your personality shine through, especially by what your wearing! Always refreshing! Hope you survived Sea World!! I think this outfit shows the true Texas girl! Love it! I'm in love with your boots! I think that it's great when a person doesn't limit themselves to a certain style and just goes with what feels good for them. I love seeing what you'll wear because it's always different. You're right - style is a form of expression and your mood can change from one day to the next, so why shouldn't your style? My style is all about comfort, but that can be expressed in so many ways. So yeah, color outside the lines of style and break that mold, woman! Love the boots! They're the perfect color to go with everything.